The Upper Strathearn Combination was formed in 1863 and initially comprised the eleven parishes of Auchterarder, Blackford, Crieff, Dunning, Forgandenny, Forteviot, Fowlis-Wester, Gask, Madderty, Methven, and Trinity-Gask. They were later joined by Ardoch. Callander, Comrie, Kilmadock, Monivaird, and Muthil. The total population of the member parishes in 1881 was 27,337. A single-storey entrance block was located alongside the road at the north of the site. This probably contained the porter's quarters, a committee room, and possibly an office for the relieving officer. A stone plaque gives the date as 1863. 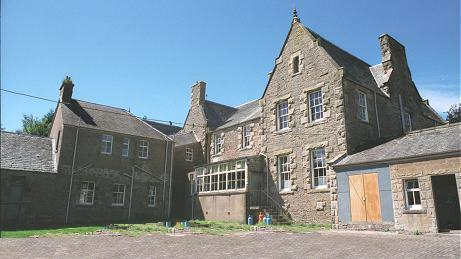 Upper Strathearn entrance block from the west, 2001. The main building was a typical H-shaped layout. The larger block at the front was a corridor plan building with a central portion which would have contained the Master's quarters, committee rooms and clerk's office. The two wings of the front block contained male and female accommodation, probably with the aged at the front side and able-bodied or "dissolute" inmates at the rear. Children's quarters were usually placed at the far end of each wing. 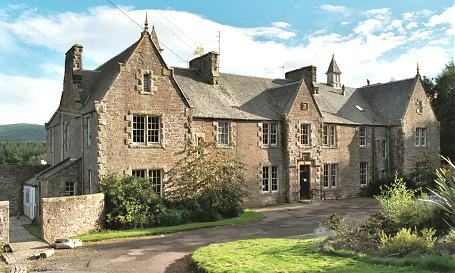 Upper Strathearn main building from the north, 2001. At the centre rear of the front block were the kitchen and the dining-hall which may also have been used as a chapel. Upper Strathearn from the east, 2001. In the rear range of single-storey buildings were found various work and utility rooms including a bakehouse on the men's side and laundry on the female side. An additional block was added later at the north-east corner of the buildings. Its function is unknown but it may have been an isolation block. After 1930, the poorhouse became known as the Strathearn Home. In 1946 it provided 71 beds including 14 chronic sick, 2 maternity, and 8 for certified mental cases, with the rest for destitute persons. The former poorhouse building has now been converted for use as office accommodation. Perth and Kinross Council Archive, AK Bell Library, 2-8 York Place, Perth PH2 8EP. Holdings include: Poorhouse minutes (1861-1962); Registers of admissions (1884-93, 1924-47); Visitors' inspection book (1937-45); Treasurer's cash books (1877-1905).